Great skirts and adorable baby!! Happy birthday to baby Jane! These skirts look so comfy - I would totally live in them. Love both of them. Initially I was rotting for the colourful one (because I'm a sucker for bright colours!) but really, the black one will be so versatile for you. First off, LOVE the skirts! And that pic on the right of the bottom 3, LOVE, LOVE this picture! Both you and baby girl are looking forward with a smile--precious! Frame it! Fab skirts! I love a jersey maxi skirt for Spring/Summer. 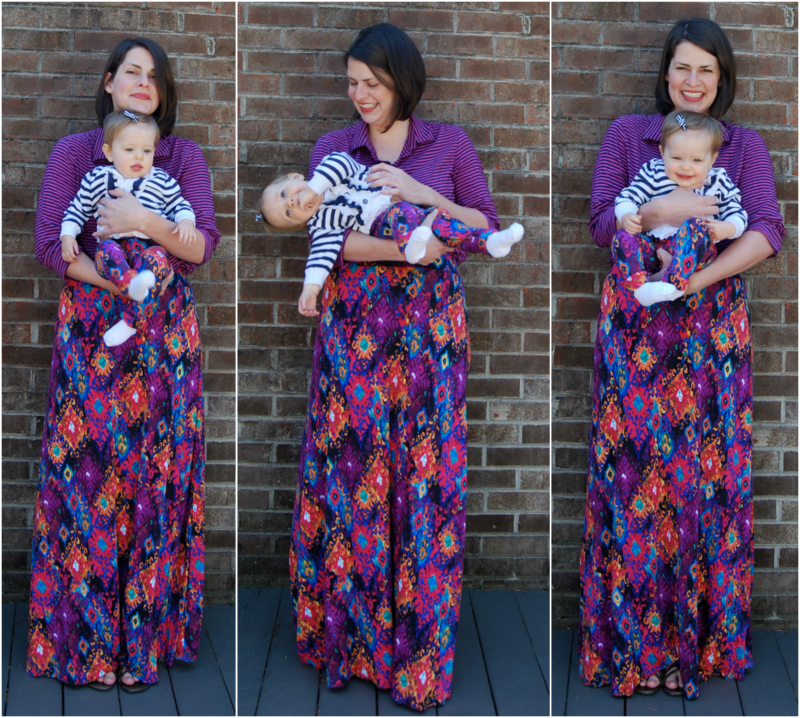 OK, world: thanks to Liza Jane I am now convinced I should try a maxi. I always thought I would look short and frumpy, but yours are so fun. Love them! I love mama-daughter matching!! Those last three pictures are too cute! Happy birthday, baby Jane! I love the bright skirt and your adorable baby's leggings but I think you will find that a plain black swishy maxi is a garment where you can go mad with the accessories..
why you gotta do that to me so early in the morning. I had something nice to say about your skirts, but then OMG CUTE BABY! That's happened on your blog before, I think. Anyway, back to the skirts, I love them! The black one especially will be such a great staple. Camouflage baby!!!!! ACK! So cute! Um, your skirts are so swirly and dramatic and fabulous! F yeah you get compliments when you wear these!!!!! these skirts are both awesome! i'm dying to make a few myself, they always look so chic and put together. Of course the bright and swirly accessorised with baby steals the show, but I bet you wear the black one all the time! I've just made a navy midi length skirt - completely plain - and have barely taken it off because it goes with everything! I can't believe your daughter is one already. That feels like such a fast year!! Beautiful skirts! I'm on the short side, so I've never made a maxi because I'm worried it wont look good on me.. But these are so pretty I may have to change my mind! Happy Birthday to Baby Jane!! What a cutie. I love the skirt and matching leggings! Love Love LOVE the quarter circle maxi. Those colors are simply gorgeous! And hello to your toddler! Oh wow. A year? Really??!! Time is going by too fast Liza. Too fast! Oohhhhh!! One year old?!?! Love the mama and babe matching that's going on here - you two look stunning! 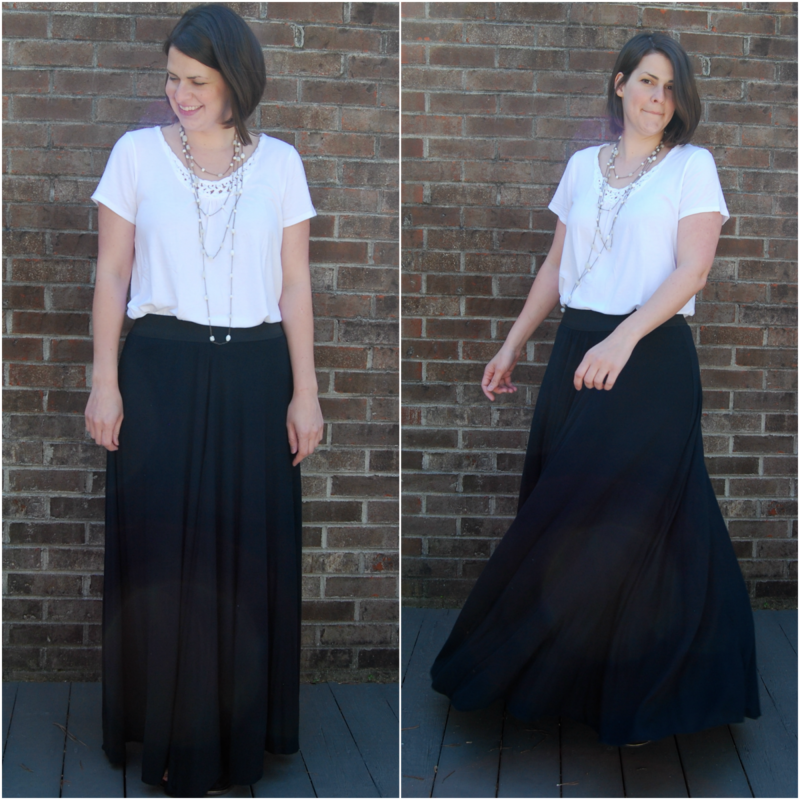 And these maxi skirts just seem like the perfect fast, comfy-yet-chic, sewing makes! I can't decide which I love more - the practical, goes-with-everything black version, or that FANTASTIC bright print (you look gorgeous in purple, btw)! Truly a toss up, because they are both winners!! My love of maxi skirts is immense, and yours are both FAB-U-LOUS!! I love the multi-coloured one, and missy in her matching legging is gorgeous! Lovely skirts. And hooray for matching mommy/girl clothes. Liza, where oh where did you find that striped jersey blouse in the 2nd skirt photo?? For me, my new style most seasons of the year is a circle maxi skirt or dress with a blouse or t-shirt! As an amateur seamstress, I'm also tackling 40's shirt dresses and day dresses to wear for more formal events as well as for church. Timeless, modest and feminine dontchya think? ;) Thanks! Hey Amy!! The striped blouse is from banana republic. I bought it a couple of years ago but it is a favorite, for sure. There is nothing easier to wear than a maxi skirt with some swish, believe. And I'm a big fan of shirt dresses, too. Classic and definitely timeless!